I heart Banapple too, but I don't understand why the smiley has to be sideways "text" style..
One evening, Rina was out with her high school friends, and I was home alone as usual.. (I don't like going out at night.. only to eat hehe) She texted me asking if i've heard of the restaurant called "Bannaple", because she was there at that moment, and felt that i would love practically everything they have on their menu. I saw the colorful Banapple signage along Katipunan, but I had no idea it was a restaurant. I actually thought that it was just a Bakery who sold a "Banapple Pie" (I guess I didn't really think things through). It intrigued me but i never got around to trying it. I did a lot of research, and everyone I asked, and all the sites I checked had rave reviews for the place, so I had to go try it myself. Since Rina and I had just moved to Antipolo for the meantime, we decided to take my mom and my brother out for a nice lunch there. Rina warned me, however, to make sure we got there early. From what she's heard, if you get there by the peak of lunch or dinner, good luck getting a table. We got there by around 11:30, and there were at least three tables already taken. 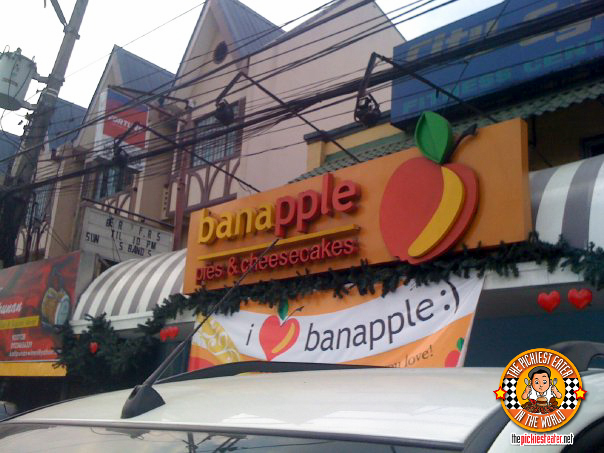 For those who don't know, Banapple has two branches along Katipunan. We went to the original, albeit much smaller one. Bannaple has one of those menus where you can just stare at all day, and by midnight, you still don't know what you want to order. (Secretly though, that was one of the reasons why i decided to bring my mom and brother, so I could try more dishes without looking like a pig). The beauty of the menu is in its simplicity. 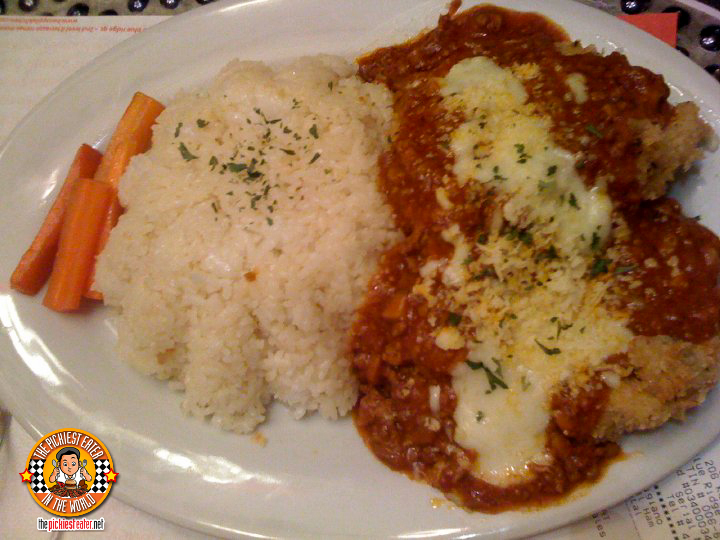 The dishes aren't out of this world and won't dazzle you with its creativity, but what it will do is offer you comfort food that you'll be looking forward to time and time again. 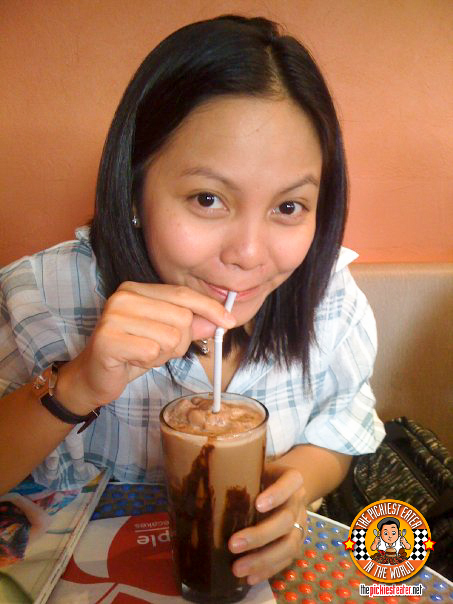 Rina and I decided to taste their Choco-bana Shake, which she seems to really love, even though she's not exactly fond of bananas. It was nice and thick, and the taste of the Banana didn't overpower the creaminess of the chocolate. I don' really remember the price, but to be honest, regardless of how much it may have cost (which probably wasn't really all that much to begin with) it was worth it. It doesn't look too pretty in this picture, but it was actually pretty darn good..
Much to Rina's surprise, I ordered the Savory Longganiza with Caramelized Onions (P140). She was expecting me to get the Hickory Smoked BBQ Country Ribs, and to be honest, so was I. I Don't know, something in my gut told me to try it, and I was not disappointed at all. Like I said, in my previous post (see here) I have a thing for Longganiza! The Longganiza was crunchy without being burnt at all, and the caramelized onions gave it a light sweet kick to it. 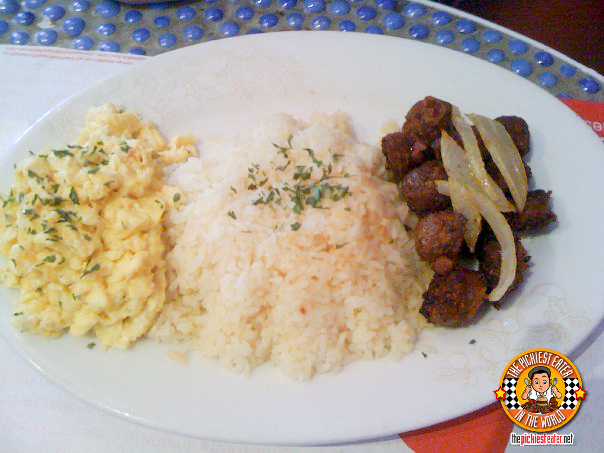 I loved the creamy eggs (which I learned how to cook over the weekend btw.. add eggs and umm.. cream..) as well. It also came with a very generous serving of parsley topped Garlic fried rice. 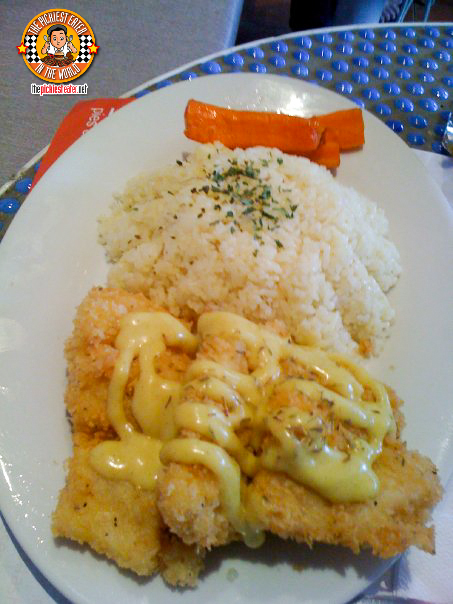 Dory and Honey Mustard Sauce.. A match made in heaven..
My mom ordered the Breaded Fillet of Cream Dory (P160), a dish that I had been anxious to try. Though it was breaded, the fish was still moist inside, and the amount of bread crumbs used was just right, so it creates just a light coating that doesn't overwhelm the meat. The honey mustard sauce was blended well, and it created a nice tangyness (is that a word?) that perfectly complemented the Dory Fillet. 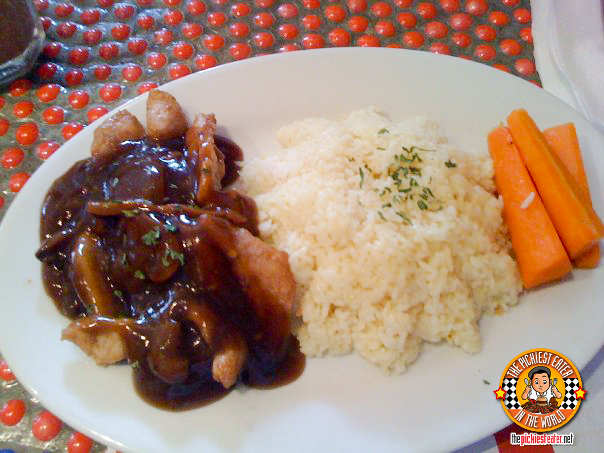 The Pork Scallopini that my brother ordered wasn't anything spectacular, when compared with the first two dishes. 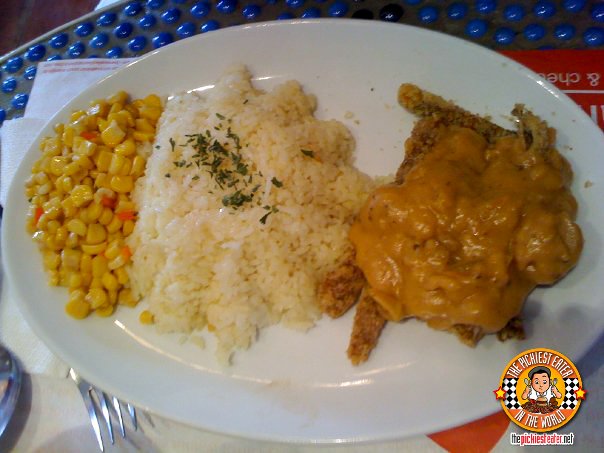 Don't get me wrong, it was a nicely fried piece of breaded pork and had a nice creamy sauce to it, but it didn't really stand out to me. 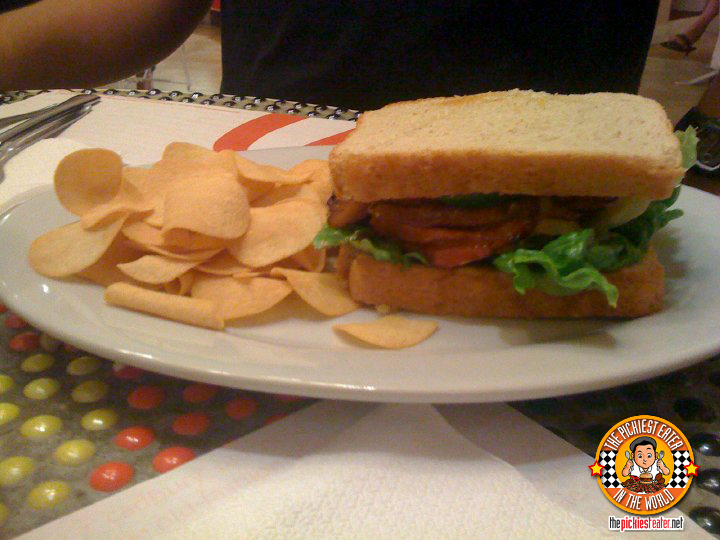 It's one of those dependable dishes that you'd order when you can't decide what you want, so you go with the safe order. Rina's Pan Fried Porkloin with Herb Mushroom Gravy (P160) had a nice zesty gravy to it, but funnily enough, that was also what became the problem. There was so much sauce to it that you could really taste the meat anymore, which was delicious. In effect, the gravy became the meal, and the meat became the condiment. Maybe they should change up the ratio a little bit next time, because it is quite a tasty dish. Three types of Sausages. All in One Pasta. Now, all in my tummy. 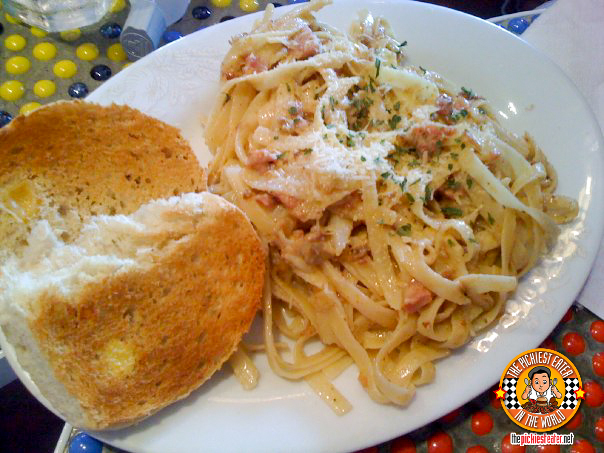 Despite my already filling orders, I couldn't resist trying the Trio of Sausage Fettuccine (P140) (Of course I shared with Rina hehe) I actually do like dry pastas, and this one didn't have that thick of a sauce, and it let the very light cream sauce and sausage flavors speak for itself. When I say sausages, I'm talking about crumbled chorizo, garlic longganisa, and Hungarian sausage. The dish needed a pinch of salt, but otherwise was something I'd order again. Now here's the thing about the desserts. Again, Rina ordered some cakes, and while waiting, my mom said she needed to go grab a smoke, so she asked Rina to come with her.. Leaving me and my brother to alone at the table. So when the Cakes came.. well.. the rest is history. And that is why I don't have any pictures of the cakes. Take it from me though, we ordered their Banoffee Pie (P70), and the Snickers Fudge Cheesecake (P90), and both knocked my Sanuks off. How good was Banapple? It was so good that after telling my friend Mark about it the following week, he had to try it for himself. 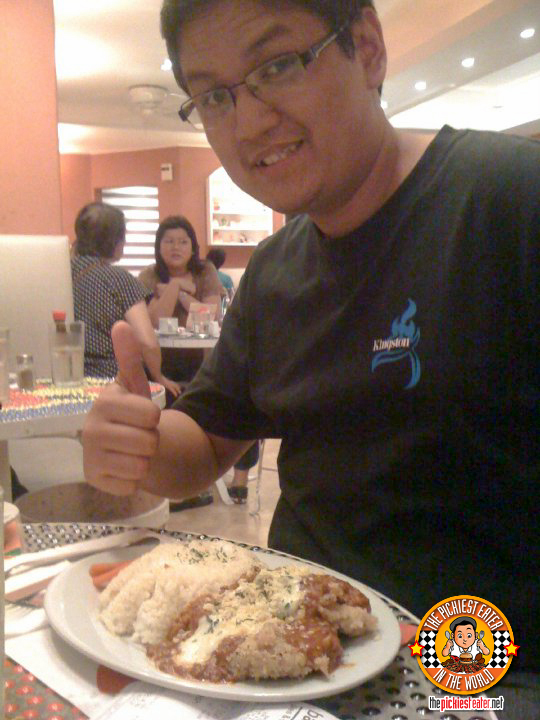 So we went back a few days later, but to the bigger branch at Katipunan, which despite the fact that it was 9 in the evening, way past dinner hour, it there were still a considerable amount of guests. Again, I used that opportunity to order some stuff I had wanted to try. Corn Chowder, just the way grandma used to make it. Grandma's Corn Chowder was a nice rich soup that is so filling, if you're not careful, you might not make it to the main course if you load up too much on this. Of course, that wasn't a worry of mine though. 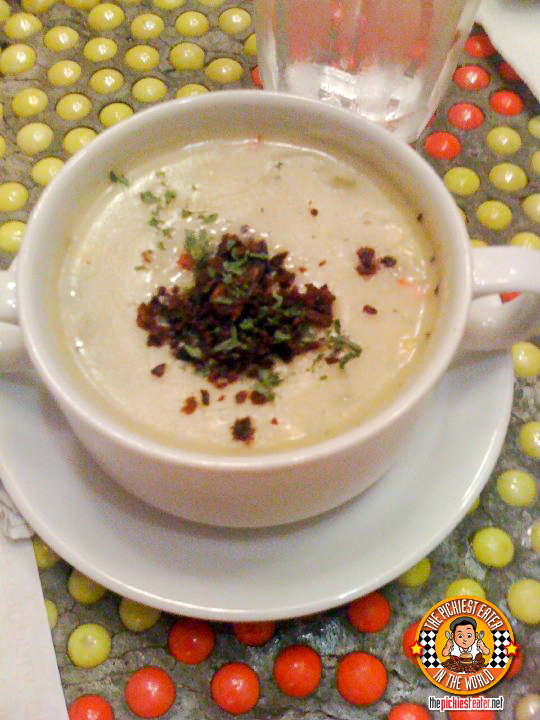 I liked the touch of adding the crumbled bacon to add a little saltiness to the very creamy soup. 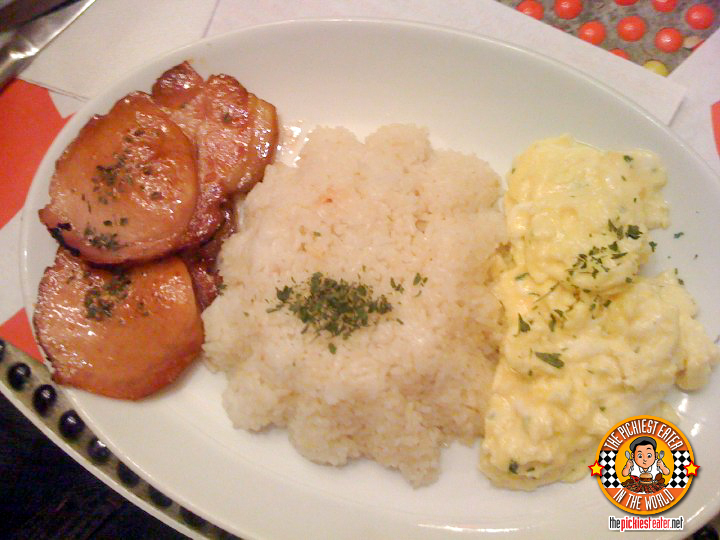 The Hearty Heavenly Breakfast (P145) is basically thinly sliced pan fried glazed ham steak with those creamy eggs that I had with the longganiza. In case you haven't noticed, I am a sucker for breakfast food, with Bacon being my ultimate favorite. (My Godmother even went as far as sending me five different types of bacon from the states one time.. best gift ever!) Since I really enjoy the taste of sweet meat, Its very safe to say that I enjoyed this very much. Mark and I both wanted to try the Rafaels Maple Glazed Ham (P130) sandwich so we decided to split one, just so that we don't feel bad about ourselves afterwards. When I bit into it, I quickly realized I should've ordered something else, because it's basically the ham from the hearty breakfast, slapped in between two pieces of whole wheat bread and other veggies. I'm not saying it wasn't good, because it was awesome, but I guess I wasn't really thinking. The only low point was that the chips they used tasted (and probably were) Piatos. I would've preferred they had made their own, something i'm sure they're perfectly capable of doing. I was actually surprised I liked this as much as I did. Mark got the Chicken Breast Parmigiano(P160) and was kind enough to let me try a piece. Of course I really couldn't eat very much of it because of the sheer volume of tomato sauce on it, but the part that I did try was pretty amazing. I really hate the breast part (strictly talking about poultry here) mainly because the meat gets dry very easily. This was a nice juicy piece of chicken, and the tomato sauce had a light sweetness to it that made taking only one bite impossible. Banapple is one of the few restaurants that I know, where you can close your eyes and pick out something in the menu, and you can't go wrong. I plan to go back here, armed with Rina and her camera, and take pictures of more dishes and their desserts. I went one more time since, and the amount of guests that it gets during one evening is insane, so if you do plan to visit Banapple, I seriously reccomend going to the bigger branch on Katipunan (the side going towards Ateneo) and go a little bit before dinner. If not, you're in for the fight of your life. * pix taken from Rina's IPHONE, hence the quality. I wanna try their meals! 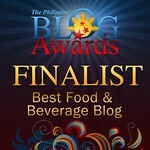 I so love their Banoffee Pie, HoneyLovin' Crunch Cake and Myster-Reese's Pie! Hope they'll be in Makati soon. Thanks Nico! I plan to go back to take better pictures.. hehe..